Alzheimer's disease is an illness of the brain. It causes large numbers of nerve cells in the brain to die. This affects a person's ability to remember things and think clearly. People with Alzheimer's become forgetful and easily confused and may have a hard time concentrating. They may have trouble taking care of themselves and doing basic things like making meals, bathing, and getting dressed. Alzheimer's varies from person to person. It can progress faster in some people than in others, and not everyone will have the same symptoms. In general, though, Alzheimer's takes many years to develop, becoming increasingly severe over time. As the disease gets worse, people need more help. Eventually, they require total care. 2. What are the main stages of Alzheimer's disease? Alzheimer's disease has three stages: early (also called mild), middle (moderate), and late (severe). Understanding these stages can help you care for your loved one and plan ahead. A person in the early stage of Alzheimer's disease may find it hard to remember things, ask the same questions over and over, lose things, or have trouble handling money and paying bills. As Alzheimer's disease progresses to the middle stage, memory loss and confusion grow worse, and people may have problems recognizing family and friends. Other symptoms at this stage may include difficulty learning new things and coping with new situations; trouble carrying out tasks that involve multiple steps, like getting dressed; forgetting the names of common things; and wandering away from home. As Alzheimer's disease becomes more severe, people lose the ability to communicate. They may sleep more, lose weight, and have trouble swallowing. Often they are incontinent—they cannot control their bladder and/or bowels. Eventually, they need total care. 3. How is Alzheimer's disease treated? Currently, no medication can cure Alzheimer's disease, but four medicines are approved to treat the symptoms of the disease. These medications can help slow down memory loss and allow people with Alzheimer's to be more comfortable and independent for a longer time. 4. How can you learn more about Alzheimer's disease? Here are some ways you can learn more about Alzheimer's disease. Talk with a doctor or other healthcare provider who specializes in Alzheimer's disease. Check out books or videos about Alzheimer's from the library. Go to educational programs about the disease. Visit the website of the National Institute on Aging's Alzheimer's Disease and Referral Center (ADEAR). Read about Alzheimer's disease on NIHSeniorHealth. 5. How can you let family and friends know that someone has been diagnosed with Alzheimer's? When you learn that someone has Alzheimer's disease, you may wonder when and how to tell your family and friends. You may be worried about how others will react to or treat the person. Others often sense that something is wrong before they are told. Alzheimer's disease is hard to keep secret. When the time seems right, be honest with family, friends, and others. Use this as a chance to educate them about Alzheimer's disease. You can share information to help them understand what you and the person with Alzheimer's are going through. You can also tell them what they can do to help. 6. How can you help children understand Alzheimer's disease? You can help young children understand Alzheimer's by answering their questions simply and honestly. For example, you might tell a young child, "Grandpa has an illness that makes it hard for him to remember things." Know that their feelings of sadness and anger are normal. Comfort them. Tell them they didn't cause the disease. Show children they can still talk with the person and help them enjoy things. Doing fun things together, like arts and crafts or looking through photo albums, can help both the child and the person with Alzheimer's. 7. 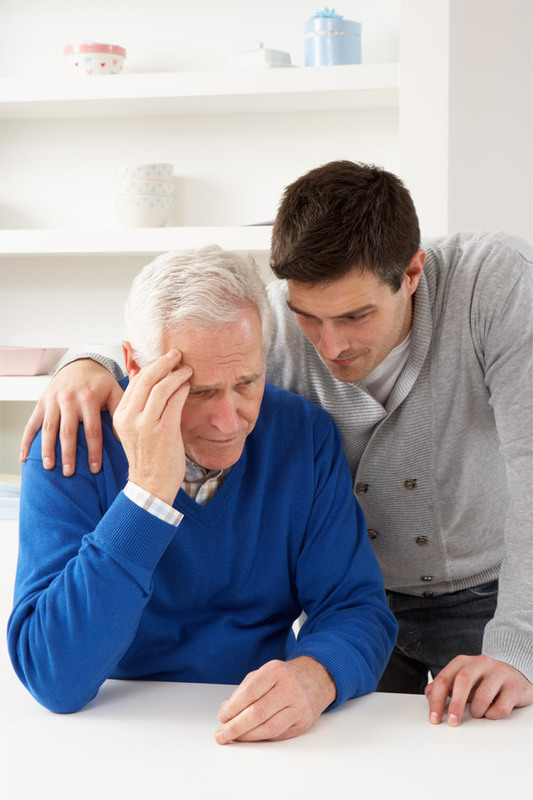 What legal and financial documents are important for a person with Alzheimer's to have? A do-not-resuscitate (DNR) form tells healthcare staff not to perform cardiopulmonary resuscitation (CPR) if a person's heart stops or if he or she stops breathing. 8. What everyday activities might interest a person with Alzheimer's? Plan activities that the person with Alzheimer's enjoys. He or she can be a part of the activity or just watch. Also, you don't always have to be the "activities director." Adult day care services provide a safe environment, activities, and staff who take care of the person with Alzheimer's at their own facility. For information on adult day care services that might help you, contact the Eldercare Locator at 1-800-677-1116 or visit their website at www.eldercare.gov. Here are things you can do to help the person enjoy an activity. Match the activity with what the person with Alzheimer's can do. Choose activities that can be fun for everyone. Help the person get started. Decide if he or she can do the activity alone or needs help. Watch to see if the person gets frustrated. Make sure he or she feels successful and has fun. Let him or her watch, if that is more enjoyable. 9. How can you help a person with Alzheimer's stay physically active? Being active and getting exercise helps people with Alzheimer's disease feel better. Exercise helps keep their muscles, joints, and heart in good shape. It also helps people stay at a healthy weight and have regular toilet and sleep habits. You can exercise together to make it more fun. Here are some tips for helping the person with Alzheimer's stay active. Take a walk together each day. Exercise is good for caregivers, too! Make sure the person with Alzheimer's has an ID bracelet with your phone number, if he or she walks alone. Check your local TV guide to see if there is a program to help older adults exercise. Add music to the exercises, if it helps the person with Alzheimer's. Dance to the music if possible. Watch exercise videos/DVDs made for older people. Try exercising together. Make sure he or she wears comfortable clothes and shoes that fit well and are made for exercise. Make sure the person drinks water or juice after exercise. View, print, or download the booklet "Workout to Go" from the National Institute on Aging. To order a copy, call the Information Center at 1-800-222-2225. You may also wish to visit Go4Life®, the exercise and physical activity campaign for older adults from the National Institute on Aging. 10. What are ways to make sure that a person with Alzheimer's eats properly? Eating healthy foods helps us stay well. It's even more important for people with Alzheimer's disease. Here are tips for healthy eating when a person with Alzheimer's lives with you. Buy healthy foods such as vegetables, fruits, and whole-grain products. Be sure to buy foods that the person likes and can eat. Buy food that is easy to prepare, such as pre-made salads and single food portions. Have someone else make meals if possible. Use a service such as Meals on Wheels, which will bring meals right to your home. For more information, check your local phone book, or contact the Meals on Wheels organization at 1-888-998-6325. Here are tips for healthy eating when a person with early-stage Alzheimer's lives alone. Buy foods that the person doesn't need to cook. Call to remind him or her to eat. In the early stage of Alzheimer's disease, the person's eating habits usually don't change. When changes do occur, living alone may not be safe anymore. Look for these signs to see if living alone is no longer safe for the person with Alzheimer's. The person forgets to eat. Food has burned because it was left on the stove. The oven isn't turned off.